My father, Shlomo Perrin, was a London furrier who came from a family which was close to Lubavitch for generations. One time, while visiting the United States, he came to meet the Rebbe and became his loyal follower, as later did I. The stories I would like to relate here concern the wise advice that the Rebbe gave my father and me over the years in our various business ventures. In 1956, my father got word that the Shell Oil Company was going to take over another oil company, Canadian Devonian, and when that happened, the shares of the Canadian company would go through the roof. My father decided that he wanted to know what the Rebbe meant by “if you want to learn a lesson” so he bought a thousand pounds worth. And then he followed the Financial Times to see what would happen to his shares. As it turned out, because of the Suez Crisis of 1956, Shell never bought the Canadian company whose shares started going downhill. In a short time, my father’s thousand-pound investment was worth only two-hundred-and-fifty pounds. So then, my father asked the Rebbe what to do. The Rebbe said, “Wait until it goes back up to five hundred and sell.” My father did just that. He sold at five hundred – meaning he only lost half of his investment – and after that the bottom fell out of the whole thing. Another time, a good friend from Cuba came to my father with a very promising business proposition. My father had our accountants look the deal over and they pronounced it excellent, but he would not proceed until the Rebbe gave his blessing. But when he wrote to the Rebbe, the answer came back, “Under no conditions should you have anything to do with this.” So my father told the man that he could not go forward. My brother-in-law was upset, but he accepted that the Rebbe knew best. Indeed, two weeks later, the man from Cuba dropped dead while walking in the street. Had we put any money in his venture, we would have lost everything. The Rebbe also saved my skin. There came a time when fur prices started dropping, which was very unusual. As a result, I was in a quandary. How could I buy goods today, if they would be worth less tomorrow than what I paid for them yesterday? I was afraid to buy, but without buying I couldn’t sell. So, I packed a big van with furs and set off for Glasgow. There I stayed in a Jewish hotel and I did great business. Everyone bought from me, and they sent their friends to me. I sold everything I had brought with me in the van. I phoned my father, who shipped another carton of furs on the train. That was the start of my business in Scotland which lasted for twenty years and was very successful. Needless to say, both my father and I were big supporters of Chabad and of the Rebbe’s many projects. When I undertook to do it, I didn’t know what would be involved in building a mikveh according to Lubavitch specifications. It proved quite complicated, and it took years in planning and execution. As I agreed, I paid for the whole of it myself and I named it the Shlomo Perrin Mikveh after my father, who would have been very proud to be associated with this or any of the Rebbe’s undertakings. Another time the Rebbe asked me to fund a bi-lingual edition of the Tanya, the seminal work by the Alter Rebbe, the founder of Chabad-Lubavitch. The Rebbe wanted to do this because he felt it would help people learn the Tanya with greater ease. I agreed, and again he gave me sixty pounds from himself and the Rebbetzin and asked me to fund the project myself. He then proceeded to give me very specific instructions about who should print the book and how it should be printed. “Every English-Hebrew book always has the Hebrew on the right and the English on the left,” he said, “But the Tanya must be the other way around – English on the right and Hebrew on the left. So that when you open it up, you will see the Hebrew first.” He gave me many other detailed directions, like where the footnotes should go, what type of paper it should be printed on – he wanted very thin, strong paper which was hard to get – and also he wanted the translation to be in modern English and easy to understand. This was another complicated project on which a number of other people besides me worked very hard – in particular Rabbi Nachman Sudak, Hershel Gorman, and Zalmon Jaffe. It took us more than six years, but in the end we succeeded. When the book was published, the Rebbe held a special farbrengen at Chabad Headquarters in celebration, and he gave each of us on the publishing committee a signed copy. I was told he had never done this before. In turn, we presented the Rebbe with a special, leather-bound volume. Afterwards, when we went to the Rebbetzin to give her a copy, she told us that the Rebbe was very proud of the new Tanya. 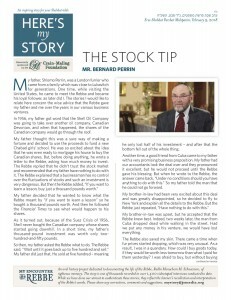 Mr. Bernard Perrin is a businessman and a supporter of Chabad in England. He was interviewed in March of 2015.